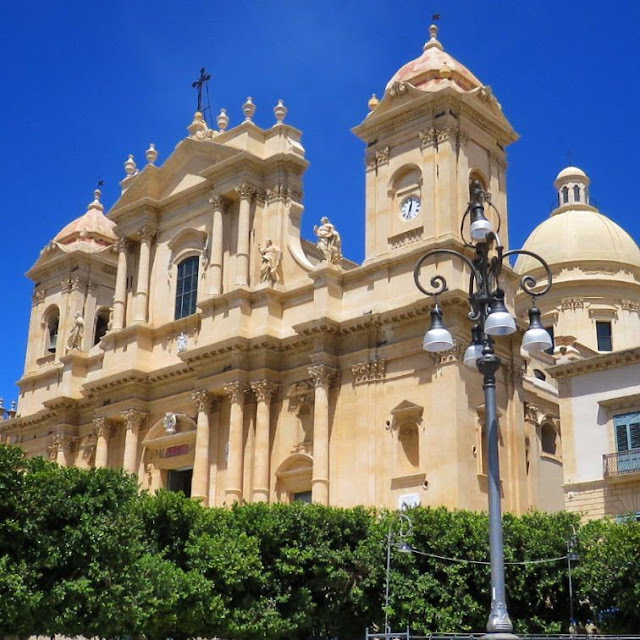 A Sicily road trip has been on our bucket list for some time now; ever since Ryanair introduced direct flights to Sicily from Dublin. Sicily embodies thousands of years of history spanning the height of the Greek and Roman empires. 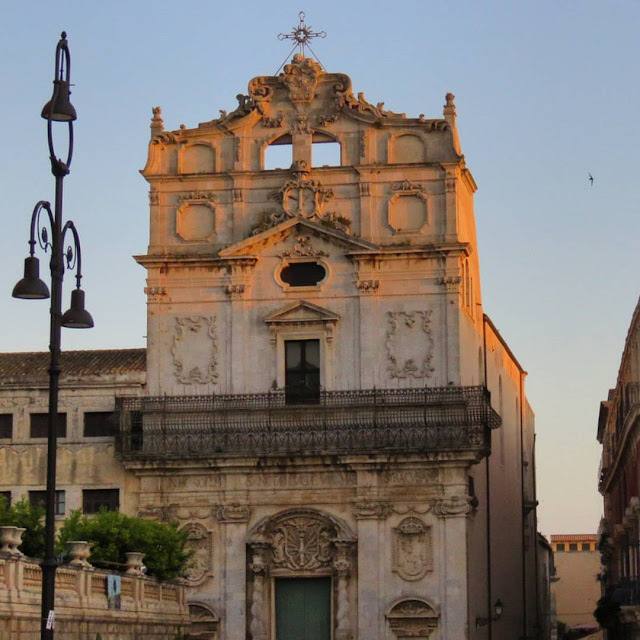 The Baroque churches of the Middles Ages in Sicily can't be beat. As in other parts of Italy, Sicily's food and wine culture is particularly strong, not to mention excellent value for money. We finally found time for a week long Sicilian road trip in May. 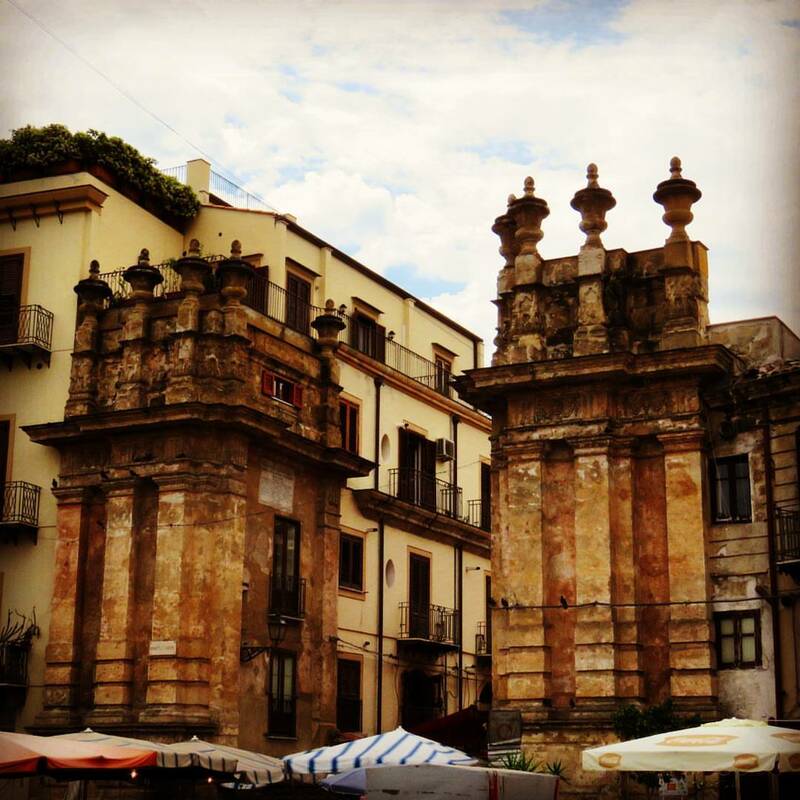 Here is my advice on making the most of a 1 week in Sicily road trip itinerary. 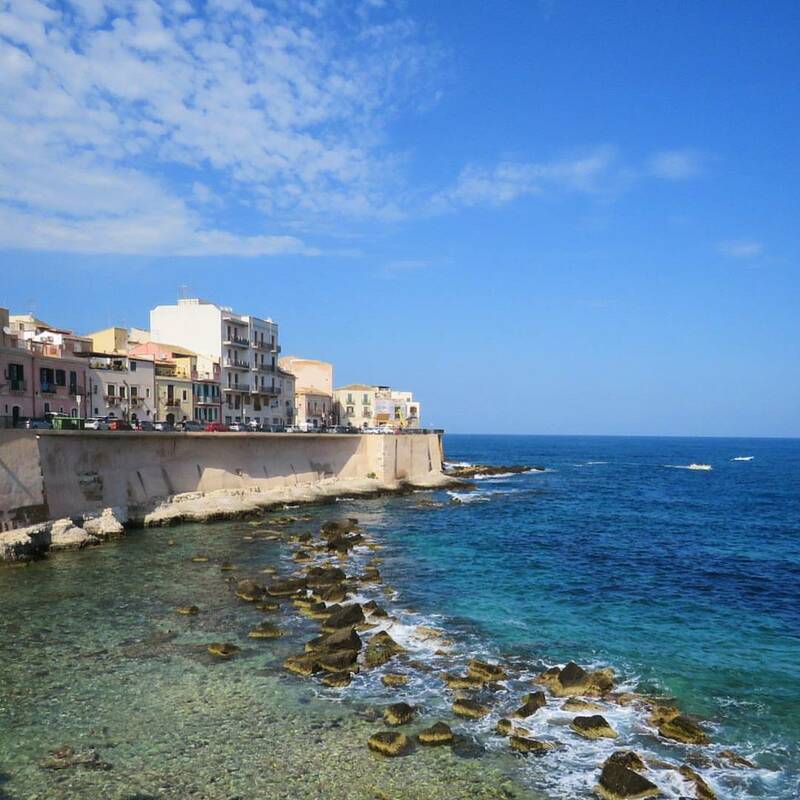 We flew from Dublin to Catania on the east coast of Sicily and drove to Siracusa (aka Syracuse). The town is known for its Greek history and culture and is the birthplace of Archimedes, the ancient mathematician. 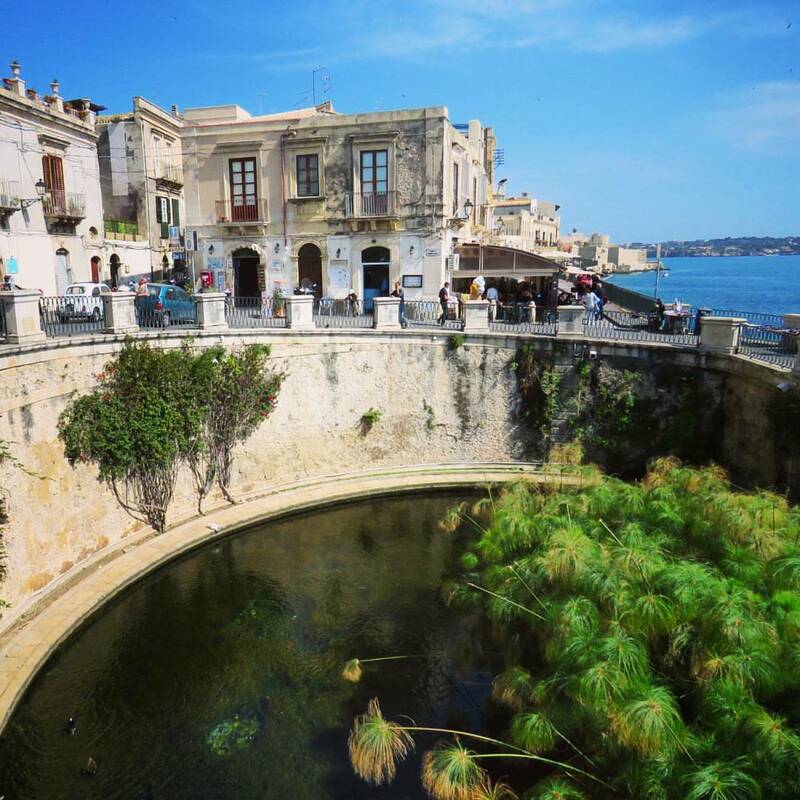 We parked our car in a lot on the outskirts of town and spent two lovely days exploring the atmospheric old town of Siracusa on the Island of Ortigia on foot. 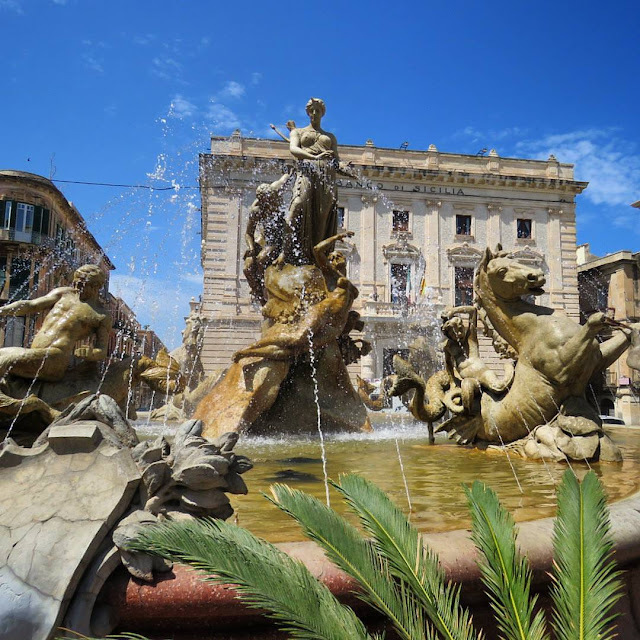 The fountains in Ortigia were particularly impressive. All roads seemed to lead to the Baroque Fonte de Artemis which recounts a key story of Greek mythology where Artemis (Diana in Roman mythology) changed Arethusa into a spring of water to escape the river god Alpheus. In modern day Siracusa, the fountain served as a convenient anchor point for our exploration. Ortigia Island featured plenty of coastline. We spent a good few hours soaking in the sun and staring out at the crystal clear blue waters of the Mediterranean. Piazza Duomo, a large Baroque square featuring the catedral and other Baroque buildings added great atmosphere to our visit to Siracusa. 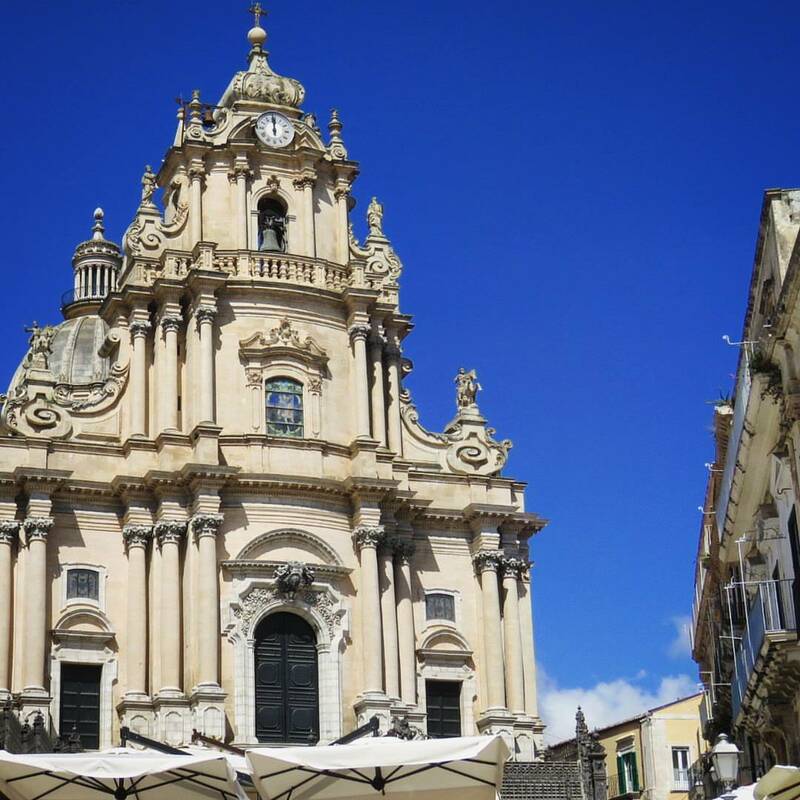 We enjoyed exploring and photographing the various Baroque churches of Ortigia both inside and out. Piazza Duomo was a great place to concentrate our exploration. Continuing the story of Arethusa, once Artemis turned Arethusa into a spring to escape Alpheus, her water flowed into the sea at this very spot. Alpheus continued his pursuit and came gushing out in this same spot mixing their waters for all eternity. Coming back to the real world for a moment, this grotto on the Island of Ortigia in Sicily is the only spot outside of Greece where papyrus (crucial for ancient paper-making) grows. 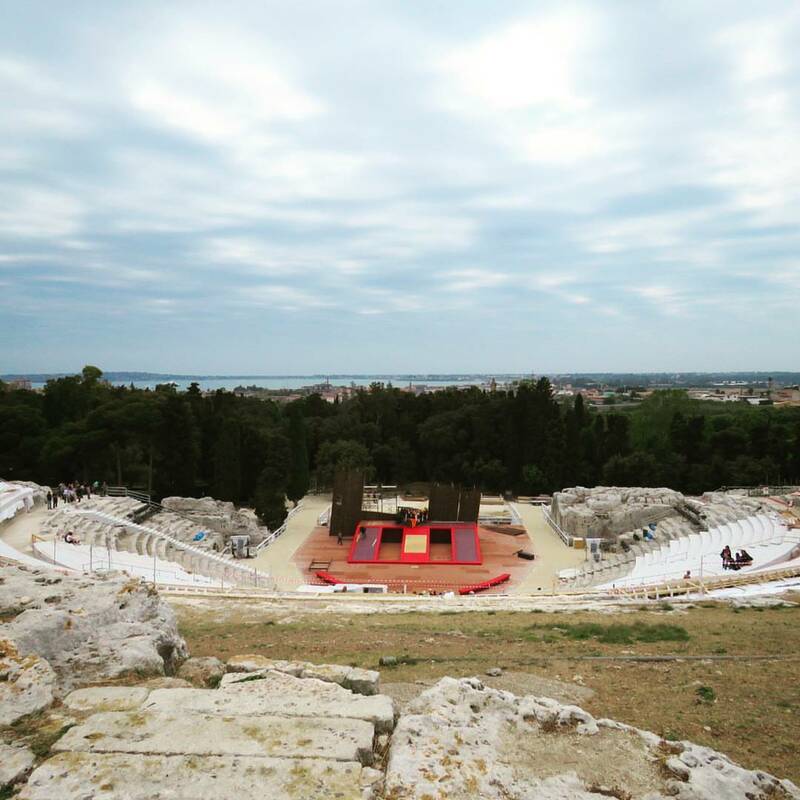 Venturing out from Ortigia back into Siracusa, we visited the Greek Theatre of Syracuse. We liked to imagine ourselves as ancient theatre-goers checking out a performance. In fact, the venue is still used for live performances today. When we visited, Siracusa was gearing up for the annual Greek Theatre Festival. In addition to the Greek ruins, the site also features some short hiking trails and the Ear of Dionysus, a cave rumored to have been used by Dionysius I to imprison dissidents and eavesdrop on their plans thanks to the outstanding acoustics in the cave. 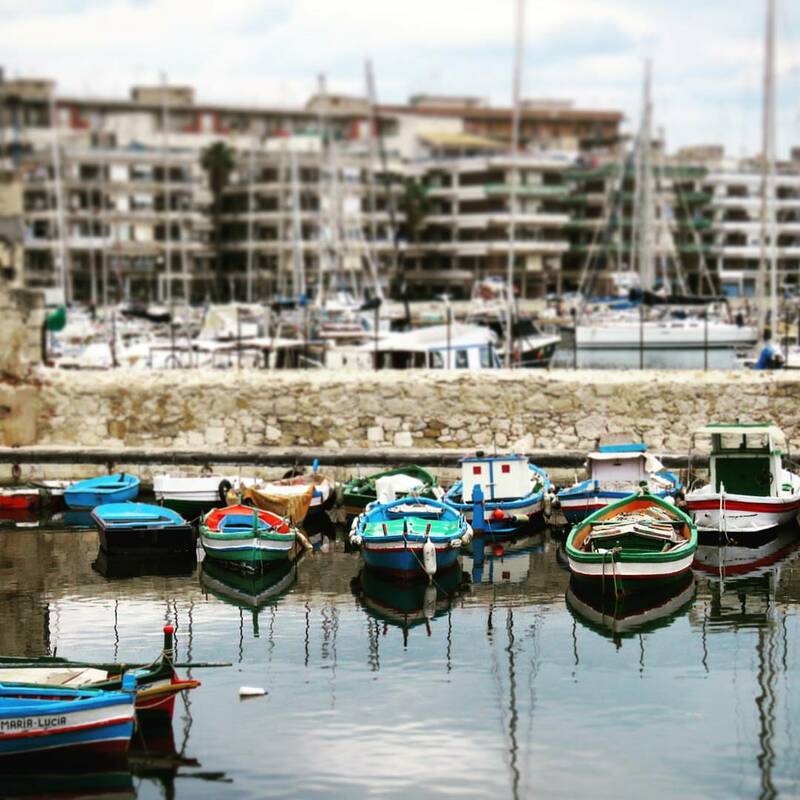 Walking back toward Ortigia island, we stopped to admire the colorful boats moored in the harbour. 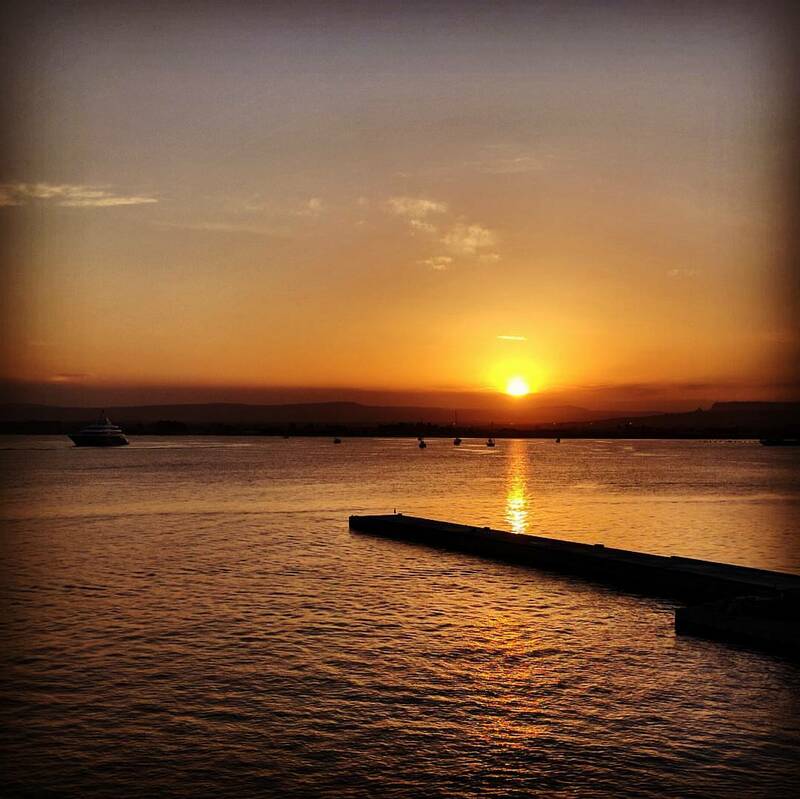 The waterfront near westward facing Fonte de Arethusa is an ideal spot to watch the sunset over Sicily. The colors and light dappled on the water was amazing to see. On our final night in Siracusa, we discovered that Sicily has a fun and quirky side. At dusk, a number of cafes feature musicians playing on the streets. We stumbled upon a band getting their Dire Straits on. I want my, I want my, I want my MTV... It was just so unexpected to hear a 1980s cover band rocking out in a tucked away corner of Sicily; we couldn't help but smile. After a lovely couple of days in Siracusa, it was time to retrieve the car and continue our Sicilian road trip. We were headed for Modica and the other Baroque hill towns of Sicily but we decided to stop at the Riserva Naturale Orientata Oasi Faunistica di Vendicari to stretch our legs first. Getting to the reserve requires a leap of faith to turn off the highway onto a super narrow dirt road. We drove to a small parking lot at the very end of the road and then continued on foot toward the sea. Our jaws dropped in awe when we spotted the brilliant blue water against a backdrop of an abandoned tuna plant. To get to the beach, we traipsed across a creaky boardwalk. Small lizards scurried to and fro when they felt the vibrations of our steps. The reserve is also home seasonally to a flock of flamingoes. We visited at the tail end of the season but were fortunate to spot a few flamingoes dozing in the distance. Such majestic creatures! We also found that the reserve (and Sicily in general) was full of swifts darting to and fro. A good number seemed to live in the eaves of the Baroque buildings. We had a fantastic time watching them buzz here and there. 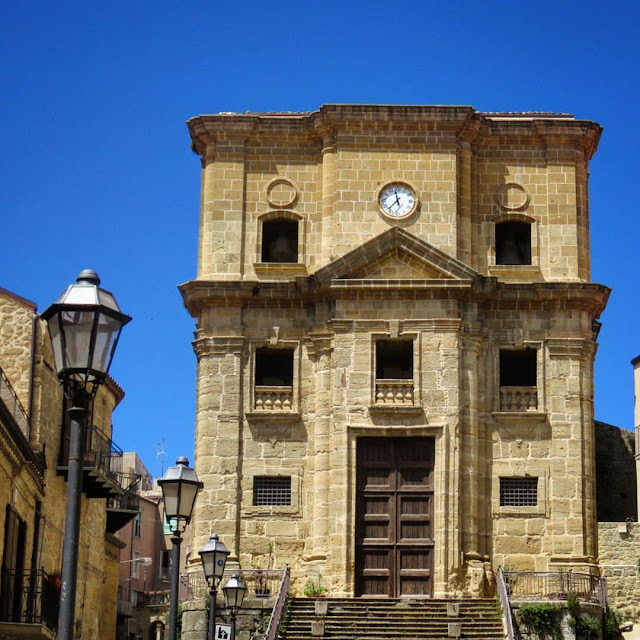 A great earthquake destroyed much of Sicily in 1693. 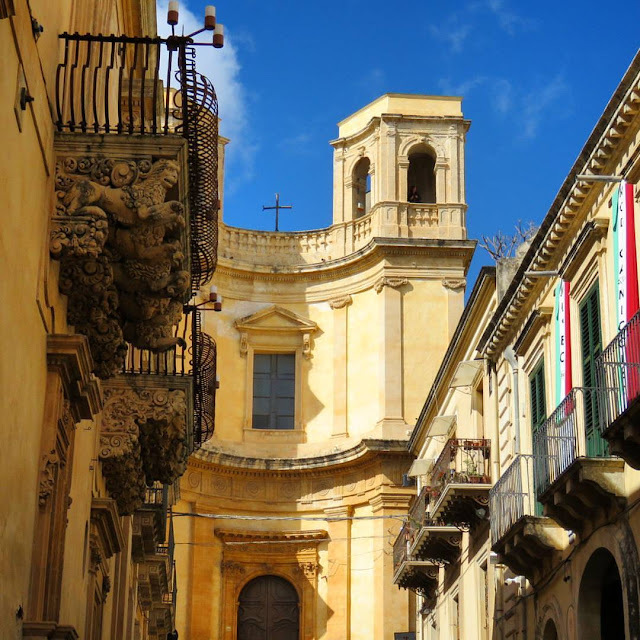 From the rubble emerged the Baroque-style architecture that Sicily is most famous for. The Baroque hill towns of Noto, Modica, and Ragusa were definitely highlights of our week long road trip in Sicily. The Baroque towns are also quite difficult to visit without the freedom that comes with renting a car. Our first stop on our road trip in Sicily was Noto. Known equally for its architecture and for having the best gelato in the world, we spent a sunny afternoon exploring church after church inside and out. There are a number of outdoor cafes and gelato shops to steep in the atmosphere. Note: many cafes are closed on Monday (when we visited) which meant we had to try a bit harder to find a place for lunch. 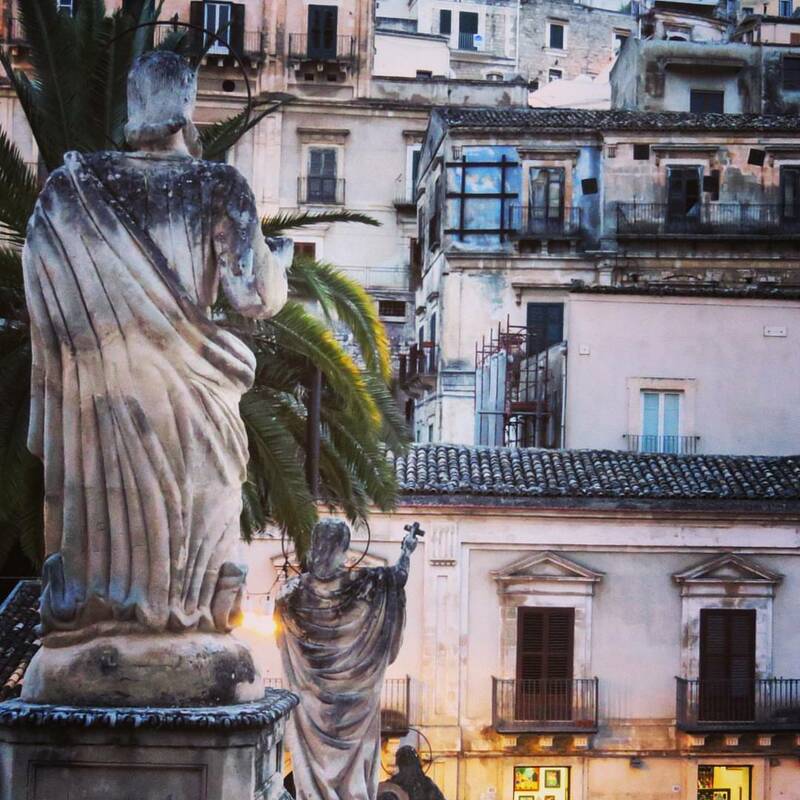 We drove into Modica just before dusk, dropped off the car, and set off to explore the town on foot. 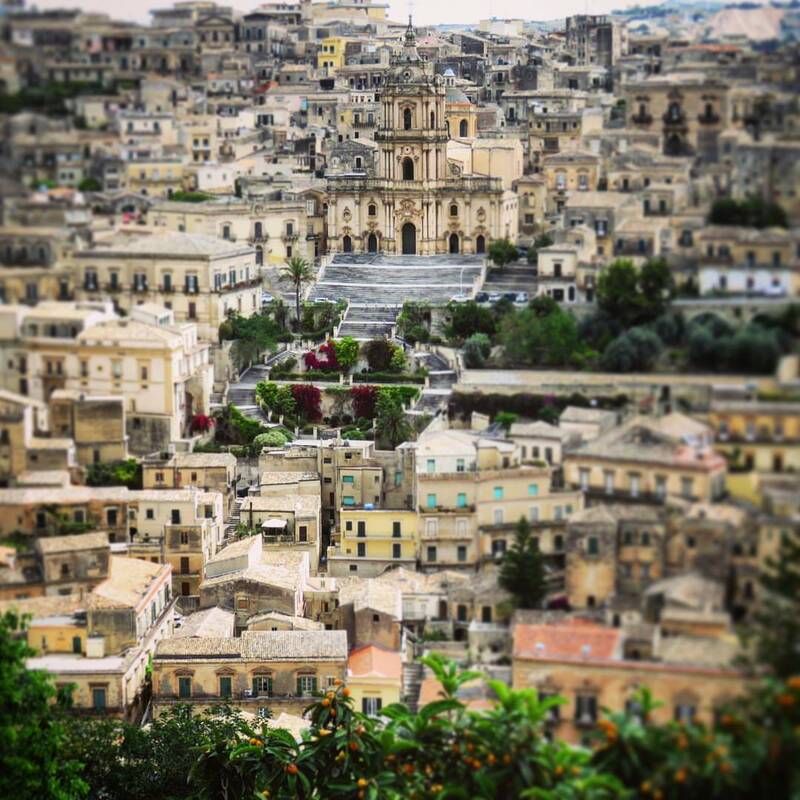 Modica not only features amazing Baroque architecture but also its very own kind of chocolate. Practically every other shop is a Modica chocolatier offering generous samples. I could get used to this! 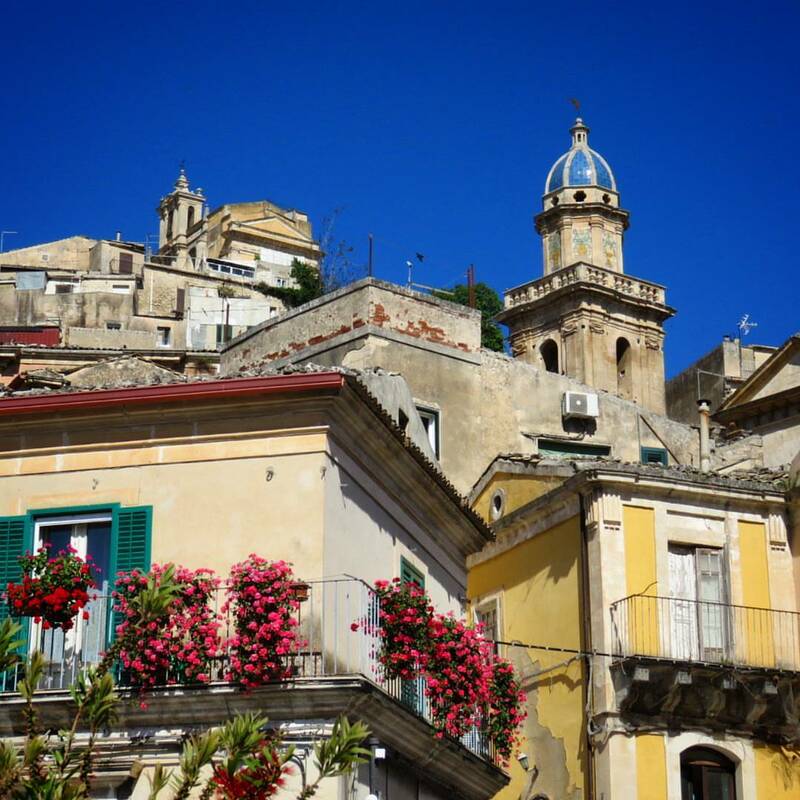 To learn more about the fabulous foods of Sicily, check out this post. The next day, we set off on a walk across town. 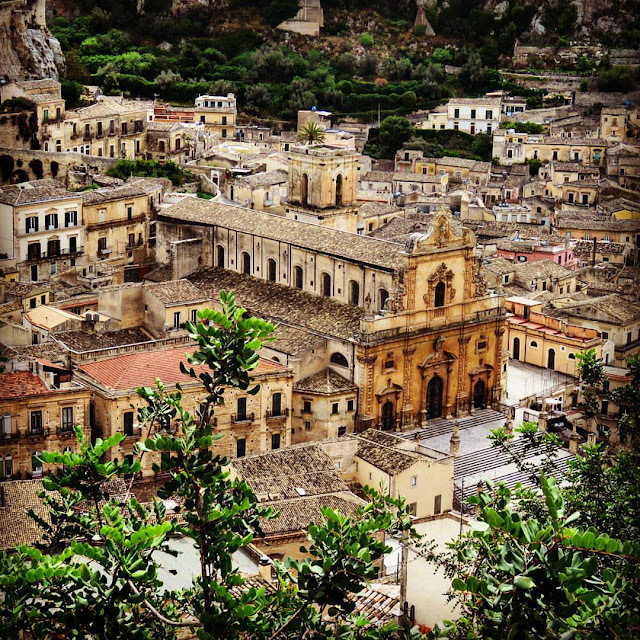 Modica is situated on two distinct hillsides. Definitely take the time to get lost while climbing further and further upwards. We admired the sooty stone buildings from above. I loved how the town seemed to just spill over the hillside. Modica offers some amazing opportunities for a photo walk. After two nights in Modica, we were ready to continue our Sicily road trip by setting a course for Ragusa, the third in the trio of famous Baroque hill towns. We spent a couple hours exploring the town on foot. Ragusa sits across two separate hills and we ended up climbing them both. We definitely worked for it and were huffing and puffing by the time we were done, but it was totally worth it for the brilliant photo opportunities at the top. Continuing our travels by car, we spent about half a day and a single night in the town of Piazza Armerina. 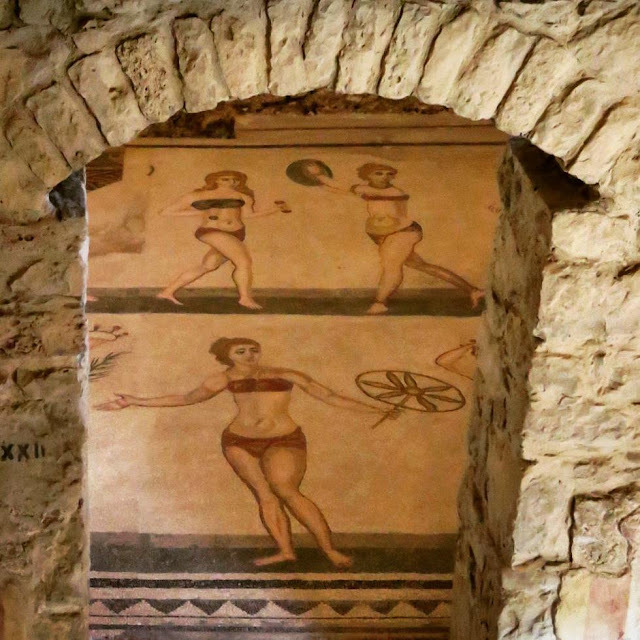 The town is famous for the nearby Villa Romana del Casale, a well-preserved Roman townhouse with stunning mosaics. What was our favorite part about visiting Villa Romana del Casale? The depictions of everyday life in the Roman Empire. We studied the bikini girls mosaic. Apparently, female athletes would work out in the equivalent of string bikinis. I'm not sure I could have pulled that off back in the day! We paused our road trip briefly to stretch our legs in Enna before making the final push to Palermo. Enna sits at the top of a hill and we drove our way up a very steep, winding, and narrow backroad to get there. It was worth it in the end when we parked the car and looked out across the valley and saw Mount Etna hovering like a ghost in the distance. Enna is incredibly picturesque and features the ruins of Castello di Lombardia which are worth a quick tour. The town lies generally along a single main street and features cafes and coffee shops flanking either side. Enna is definitely a good spot for a road trip detour while en route by automobile from the Baroque hill towns to Palermo. We were advised not to drive in Palermo because of the narrow streets, chaotic traffic, and crazy drivers. We opted to return the rental car at the airport and take the airport bus into town for a stress free arrival. We spent the final three nights of our visit to Sicily exploring all that the bustling capital city has to offer. We stayed close to Teatro Politeama Garibaldi which cut a stunning presence on Piazza Ruggero Settimo. I loved how the stain-glassed windows reflected the deep blue of the sky. The traffic in Palermo was a bit crazy and we were happy that we'd jettisoned our rental car. Cars weren't the only means of transportation though. We saw plenty of scooters and horse draw carriages. Make sure to look both ways when crossing the street and keep an eye out for speeding vehicles of all types. 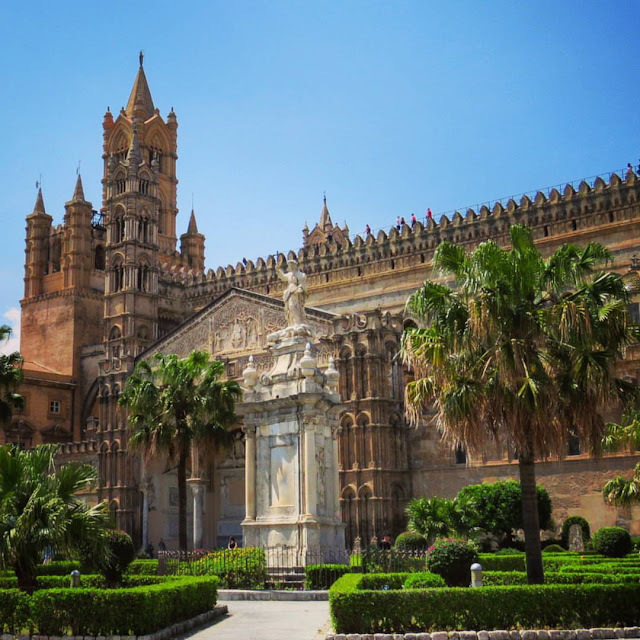 Palermo Cathedral is absolutely huge and takes up an entire city block. In addition to the beautiful facade and gardens, there is a memorial inside to Father Pino Puglisi. Father Puglisi was known as the anti-mafia priest and paid the ultimate price with his life when a hit was put out on him due to his work to turn around a rough mafia-controlled neighborhood in Palermo. The locals that we talked to looked at Father Puglisi as a local hero. There is nothing more stereotypically Italian than fast cars. Imagine our surprise though when we were strolling through Piazza Guiseppe Verdi in front of the Opera House when we found all sorts of people milling about. There seemed to be a festival on. We soon heard revving of engines and went in to take a closer look. Serendipitiously, we had arrived in Palermo on the eve of the annual Targa Florio, a road race through the mountains. Ferrari owners from all over the world had come to Palermo to participate and show off their machismo. 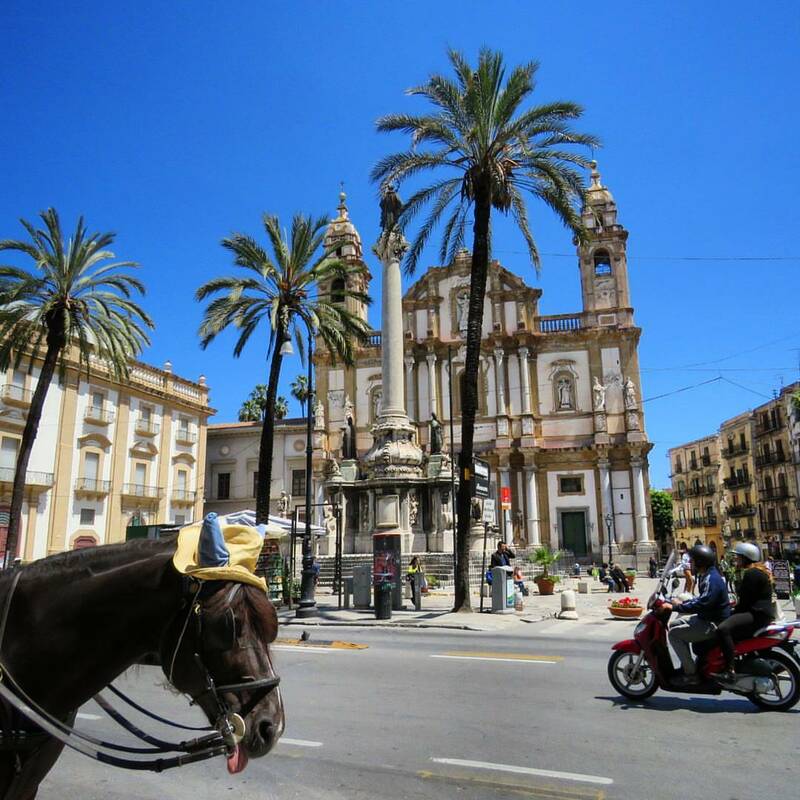 One of the major highlights of our visit to Palermo was the Streat Palermo food tour. Owner and guide, Marco, led us through Mercato di Capo and the surrounding winding pedestrianized streets between Piazza Guiseppe Verdi and the Cathedral. Along the way, we filled our bellies with authentic Sicilian street food while Marco regaled us with stories of Sicilian food and culture. I even ate a spleen sandwich \o/. 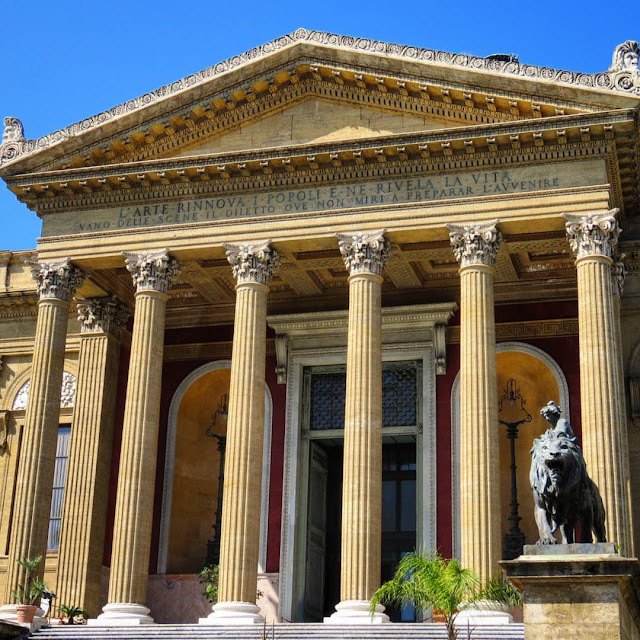 For more details about our Streat Palermo tour, check out this post. 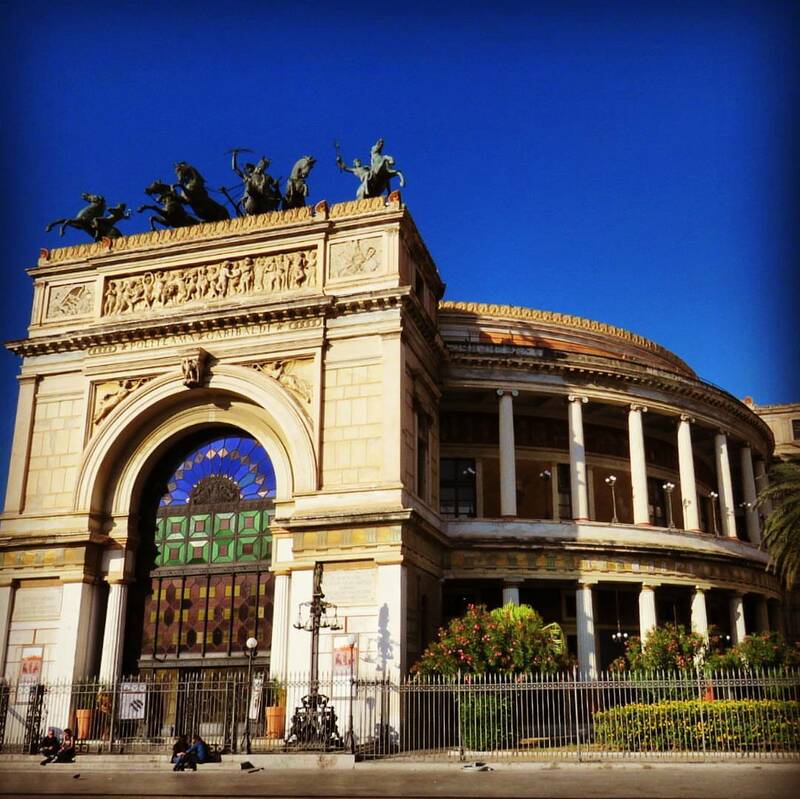 The Opera house is probably the most famous building in Palermo. It's famous not only for being the third largest opera in Europe but also for playing a pivotal role in the movie The Godfather III. Apparently, visiting Americans try to re-enact the final shoot-out on the steps of the Teatro Massimo on a nearly daily basis. We kept our composure and opted to take a brief tour inside instead. 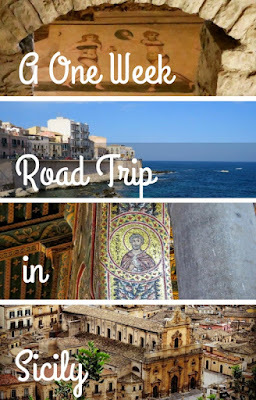 We concluded our time in Palermo and our one week road trip through Sicily with a day trip to Monreale, It's possible to get to Monreale by taking a frequent (but crowded!) public bus service. It took about 45 minutes to get there overall. 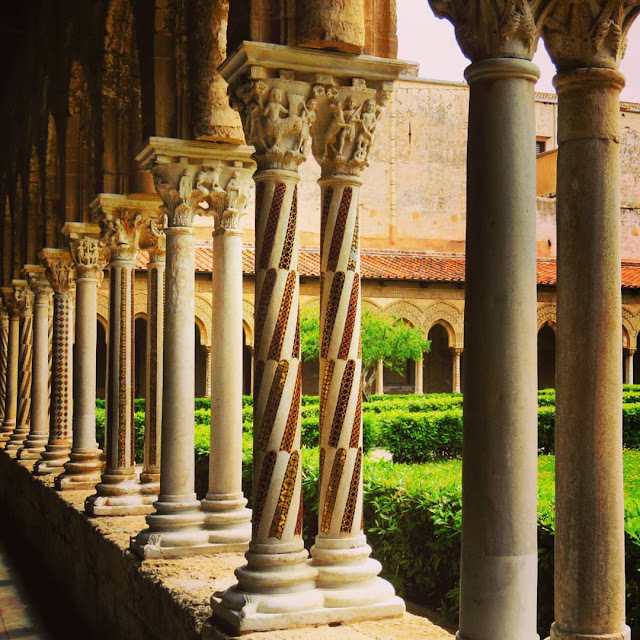 The centerpiece of Monreale is the cathedral and associated cloister which are done in Norman style. The Duomo of Monreale was recently listed as a UNESCO World Heritage Site and features a stunning interior of golden mosaics. I particularly liked the Benedictine Cloister featuring a courtyard lined with decorated pillars. The capitals are each different and feature scenes of life in Sicily at the time. 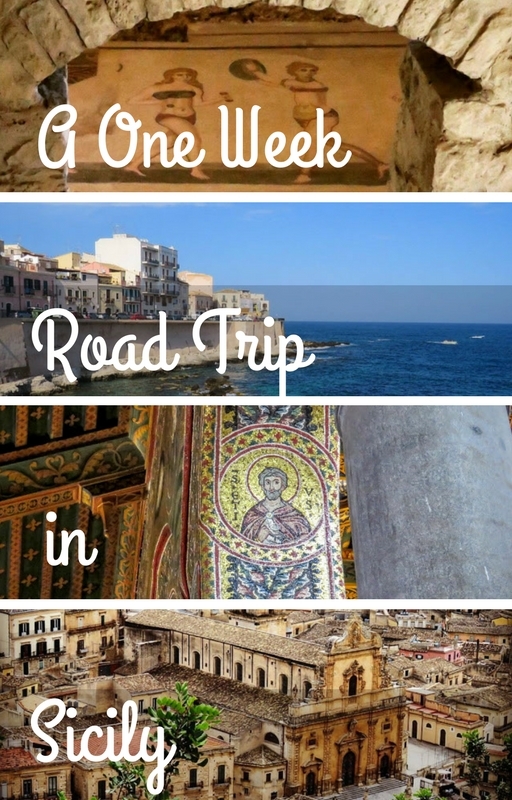 Overall, we drove a lot of miles on our week long road trip through Sicily. 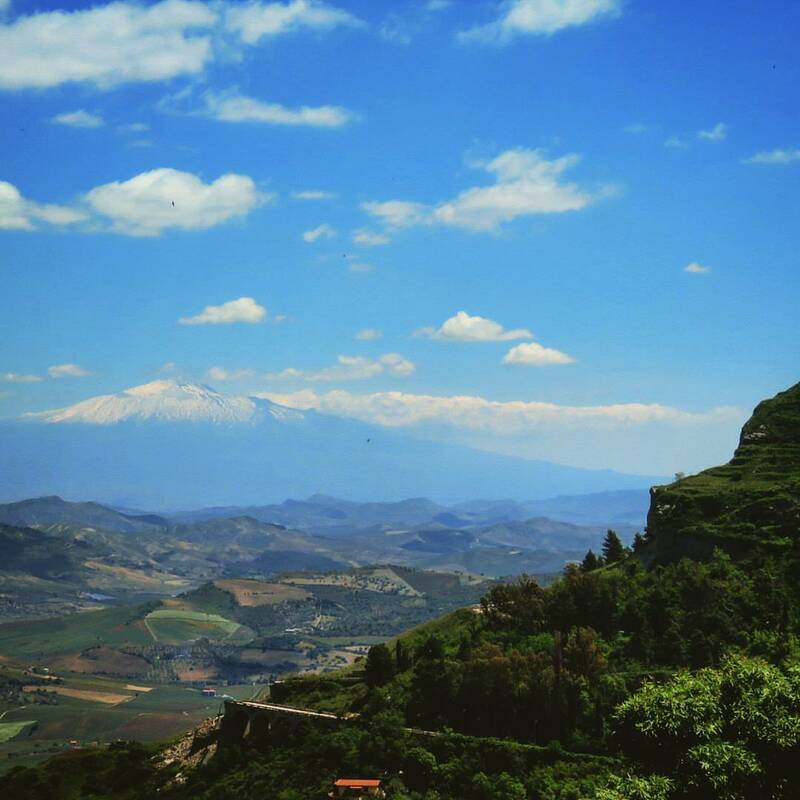 We had a great time driving around Sicily as we steeped in history and architecture and ate some of the best food and wine in the world all while having the opportunity to soak in the sun and even take a siesta every afternoon for a bit of socially acceptable relaxation. 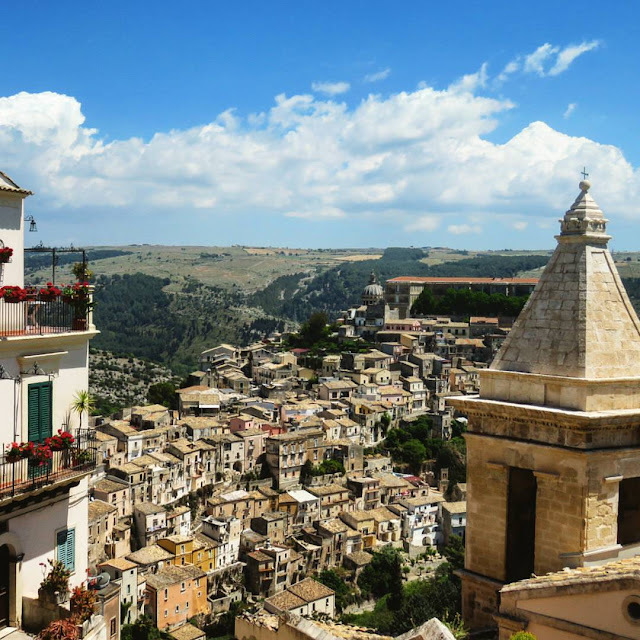 If you are looking for a combination of plenty to do while not feeling rushed, a Sicilian road trip should definitely be on your bucket list. 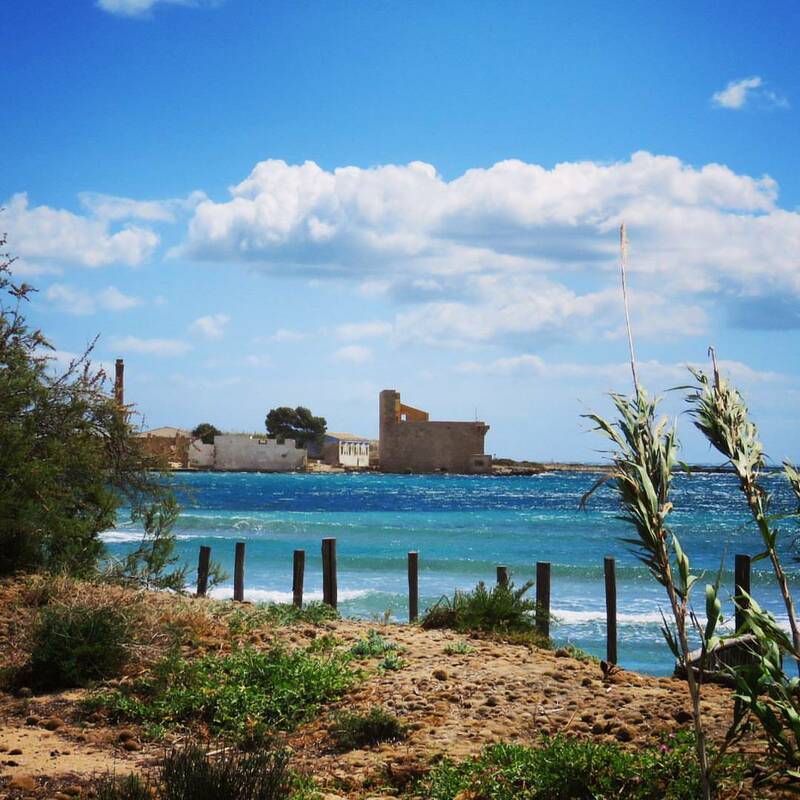 Looking for other ideas for places to explore in Southern Italy? 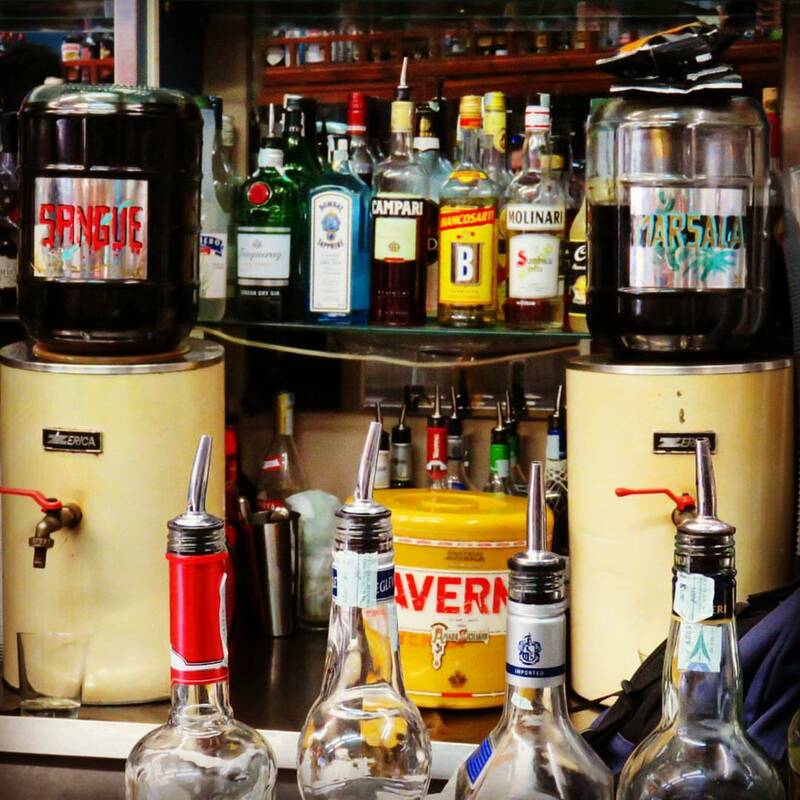 Hop on over to Next Stop TBC for Top Places to Visit in Naples and the Salento Region. Check out photos and highlights from a week long Sicily road trip from Siracusa to Palermo via the Baroque towns of Noto, Modica, and Ragusa. Learn about things to do in Sicily. Find out what to do in Sicily in one week.